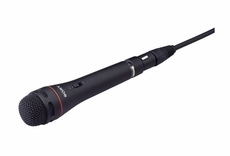 Quality dynamic hand-held uni-directional microphone. Rugged construction. Built-in LC switch. Efficient one-piece shock mount to protect the capsule from external noise and vibration. Integral double windscreen to prevent pop/wind noise. Reasonably priced to suit both professional and institutional applications.